So the Olympics have come to a close, and those of us who’ve been sleep deprived for the past few weeks can eschew the sofa for our beds at last. It was just before our Australian contingent began to leave for London in their droves, that I noticed the wattle – the green and yellow bloom which is the inspiration for our athletes’ outfits – was starting to bud. It seemed a happy synchronicity. I love it when the wattle flowers begin to appear in their cheerful, sweet-smelling profusion; for me the wattle heralds the beginning of the end of winter. The green and the gold… the uniform of our London 2012 Olympic team. The combination of a bout of nationalistic fervor coupled with the landscape’s physical representation of that fervor set me thinking – how did Australia choose wattle as its national emblem and why? I remembered how moved I was when the-then Governor General Sir William Deane, picked sprigs of wattle from the gardens of Government house to toss into Switzerland’s Saxeten River gorge to commemorate the 14 Australians who had died there in the 1999 canyoning expedition that went so horribly wrong. The push to make the wattle our national flower emblem was started by Victorian ornithologist Archibald Campbell who founded the Victorian Wattle Club in 1899. A few years later he delivered a lecture entitled Wattle Time; or Yellow-haired September,putting forward the case for the wattle to be Australia’s National Flower. By 1912 we had our first truly national Wattle day, and in the same year it was first introduced into Australia’s coat of arms by Royal Warrant. But the wattle got a head start when South Africa looked as if it might commandeer the wattle for its own patriotic purposes, which was enough to send Australia into a flurry of wattle support, although even so, as late as 1913, both waratah and wattle flowers were used as decoration on the three golden trowels used to lay the foundation stone for the commencement column in the soon-to-be national capital of Canberra. In the end of course, the wattle won, adorning our medals of honour, our stamps, our tea-towels and anything else we could think of along the way. It even has its own personal day of celebration – while the waratah had to settle for being anointed the floral emblem for New South Wales. Which is probably a good thing, because it’s hard to imagine sprigs of waratah being attached to lapels, or brims of hats, or gracing small spring bouquets. Hard too, to imagine these days anything other than the green and gold as a clarion call for nationalism. And curiously, of course, the Olympics are always held sometime between July and the beginning of September – exactly the time the wattle begins to bloom. 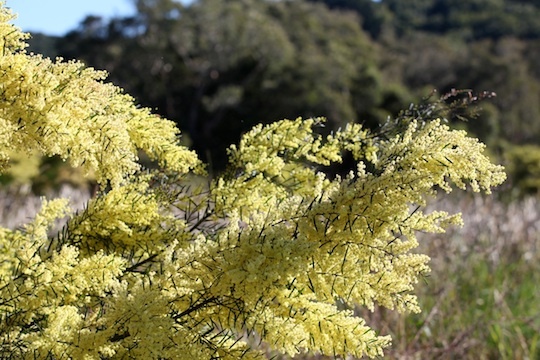 National Wattle Day is the first day of spring – September 1. The day was originally conceived as a day to demonstrate patriotism for Australia by wearing a sprig of wattle, but over the years it’s come to be a day in which we celebrate our natural environment. Wattles are Australia’s largest genus of flowering plants – of the 1380 species of Acacia in the world, Australia has close to a 1000, ranging from creepers to tall forest trees. Australia without wattle is unimaginable – we would be left with a much drier, less colourful continent. Was it something as simple as the bright yellow colour that attracted the attention of our early settlers? Yellow is the colour of the sun, which is associated with our third chakra, the solar plexus – the house of our courage and will power. Its positive attributes are joy and delight, sunshine, happiness and summer, but negatively it can mean illness, or cowardice – as in yellow-bellied. Perhaps it’s why yellow was chosen as the mediator between red and green – somewhere between danger and safe.